The Tooth Tunes children’s toothbrush from Arm & Hammer uses bone conduction technology to play a fixed two-minute song clip from select popular artists. 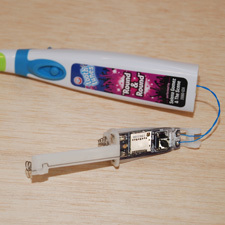 The user hears the music “inside” their head through the vibration of the toothbrush’s bristles. Based on ChaN’s Simple SD Audio Player, this hack replaces the original Tooth Tunes electronics with a custom audio player circuit, empowering the user to play any song of their choosing. The desired song is stored on a microSD card in WAV format and played when the button on the toothbrush is pressed. At the end of the song, the circuit will power itself off. The song can also be interrupted by pressing the button during playback. The circuit features an Atmel ATtiny85 microcontroller, Texas Instruments LM4864 audio power amplifier, and Maxim MAX16054 pushbutton on/off controller. It is powered by three AAA batteries. Portions of this design are distributed under a Creative Commons Attribution-3.0 United States license. It is not for sale.